1.Easy to operate,adopt advanced PLC from Germany Siemens, mate with touch screen and electric control system, the man-machine interface is friendly. 3.Automatic checking: no pouch or pouch open error, no fill, no seal. The bag can be used again, avoid wasting packing materials and raw materials. 4. 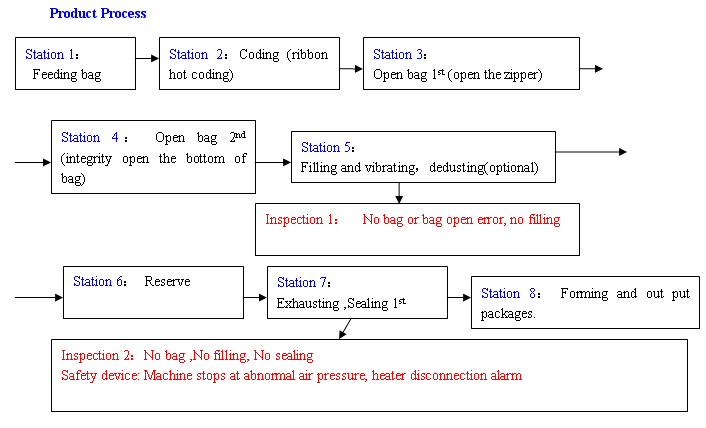 Safety device: Machine stop at abnormal air pressure, heater disconnection alarm. 5. Horizontal conveyer style to feed bag: it can put more bags on the bag storage and have a low requirement about the quality of bags. 7.It matches with the glass safety door. The machine will stop working when you open the door. So that it could protect the safety of operators. At the same time, it could prevent dust. 8. Use the plastic bearing, no need to put on oil, less pollution. 9. Use oil free vacuum pump, avoid polluting the environment in the production. 14. The packing bag suits in extensive range, suit for multi-layer compound, monolayer PE , PP and any Preformed bag made by film and paper. 1.This type can do measuring and filling work. Due to the special design, so it fits more to the liquid or low-fluidity materials, like milk powder, albumen powder, solid drink, white sugar, dextrose, coffee powder, pharmaceuticals, granular additive, dyestuff, and so on. 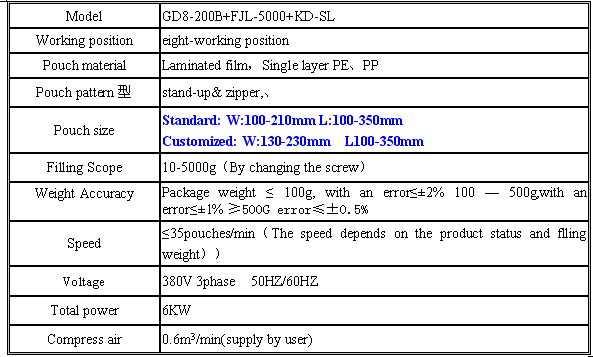 2..The surface of whole machine is made by stainless steel material except of motor. Knock down transparent hopper, which could be washed without tooling. 4.PLC control system is characteristics of stable working, anti-jamming, high precise weighing. 5.Touch screen controller shows clearly the working status, operation sign, fault state and production statistics. Operation is simple and direct. 7.Save the parameter of each product to later use. 7 recipes of magisterial formula can be saved at the most. Double motor: material feeding motor and vibrating motor, control separately. Material box vibrating and the vibrating range can be adjusted, separate design for material box, easy to take down. Strengthen vibrating motor. In order to clean remainder: The screws can reversal, the end of the material tube have valve to discharge material, the screw can take out easily. Looking for ideal Rotary Packing Machine Manufacturer & supplier ? We have a wide selection at great prices to help you get creative. All the Pre-made Bag Rotary Packing Machine are quality guaranteed. We are China Origin Factory of Pre-made Bag Packing Machine. If you have any question, please feel free to contact us.